Main & Geary pays homage to the small wineries of the early 20th century where wine, olives and other products were produced and sold on the estate. Main & Geary reconnects us to our roots, offering handcrafted wines from California’s most prolific appellations. 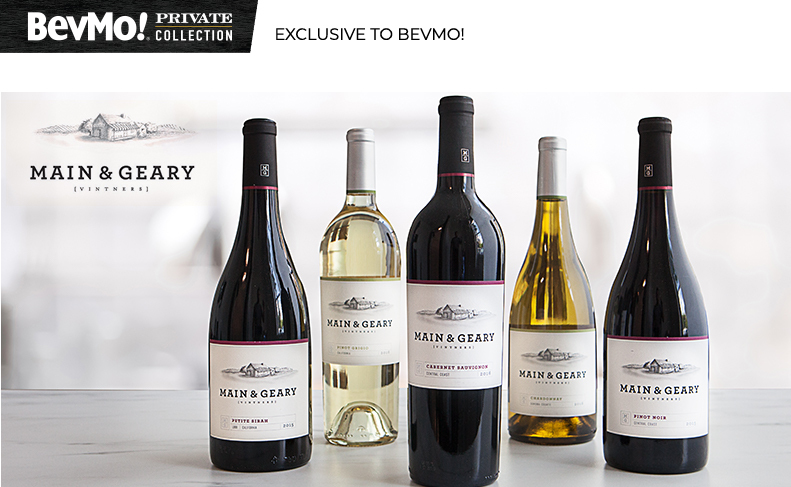 Main & Geary is a customer favorite and one of our original partner vineyards. The brand is named after the intersection of the first BevMo! location, which was established in Walnut Creek in 1994. Their winemakers use French and Eastern European oak in creative and impactful ways that vary from year to year according to the weather and soil conditions. Main & Geary is known for big flavors, balanced structure and a long finish. Try one of their top-selling varietals today. Tasting Notes: Aromas of rose petals and lemon zest. Citrus and some minerality on the palate with a crisp and harmonious structure. Tasting Notes: Blackberry, blueberry and vanilla aromas. Flavors of luscious dark fruit and mocha with a long, clean finish. Tasting Notes: Floral and bright fruit aromas. Taste of strawberry, raspberry and cherry with a crisp, dry finish. Tasting Notes: Aromas of clove, cardamom and dark fruit. Hazelnut, blackberry, cassis and plum on the light palate with subtle tannins. Tasting Notes: Light fruit aromas with flavors of apple, nutmeg and a touch of oak. Rich and balanced structure with a silky finish. Tasting Notes: Aromas of ripe berry and spice. Plum, toasty oak and vanilla flavors with a balanced structure.